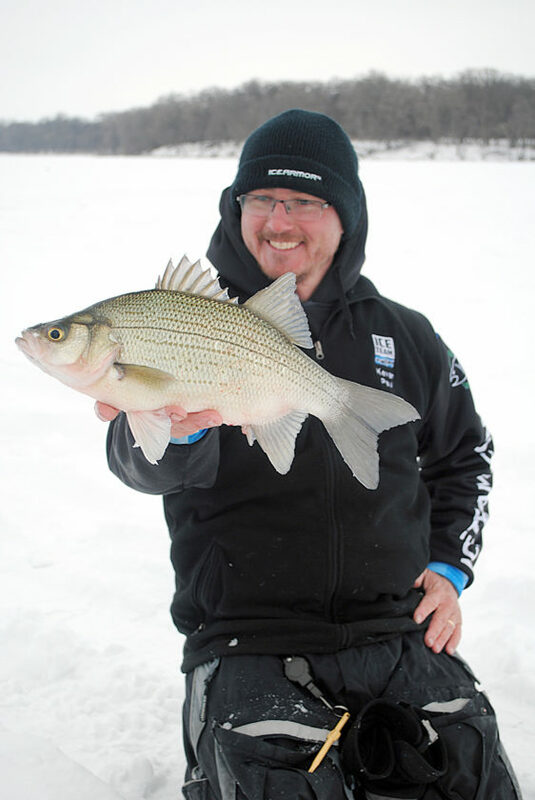 Clear Lake fishing guide Kevan Paul with a really big Clear Lake white bass that came from under the ice. It’s been a very interesting ice-fishing season so far. Ice came early to quite a bit of the ice region, then the weather got warm. Rain fell in some areas, heavy snow fell in others. We maybe didn’t lose a lot of ice, but we also didn’t make much. There’s cold weather in the forecast, and I’m starting to plan some trips to get after fish through the ice. Following are a couple of lakes that I would like to visit in the next few weeks. They both offer outstanding options for a variety of fish. One of the legendary fishing locations in the Midwest for both open water and ice is Big Stone Lake on the Minnesota/South Dakota border. Big Stone used to be known mostly for its open water walleye fishing, and it’s still an outstanding open water walleye fishery. However, in the past few years, Big Stone has really become popular for its through-the-ice perch. Simply put, it can be one of the best around. We fished perch in the open water this summer on Big Stone and caught them one after the other. There were lots of year classes, so we caught plenty of little ones which is a good indicator for the future, but we also caught plenty of those that are perfect for the table. Try the new smaller Glo-Shot Jigs from Northland. Tip them with a small minnow or waxworm. Big Stone is also developing a strong fishery for big bluegills, and of course there are walleyes. You’re going to have to experiment a bit for these two species, and of course a sonar unit is a very helpful, almost necessary tool for most ice-fishing. Vexilar has a sonar unit that will fit anyone’s needs and budget. Go to bigstonelakechamber.com to start your trip to Big Stone Lake. I have a plan to visit Clear Lake in north central Iowa very soon also. In the past ten years, Clear Lake has become one of the premier multi-species lakes in the Midwest. Through the ice you’ll catch walleyes, crappies, yellow bass, bluegills, perch, and it’s not unusual to hook up with a musky or catfish. For several years, the yellow bass in Clear Lake got a lot of ice-fishing attention, and that’s no surprise: They’re super plentiful and outstanding on the table. But recently Clear Lake fishing guide told me that last year his clients iced more walleyes than the several previous years combined. That’s good stuff! 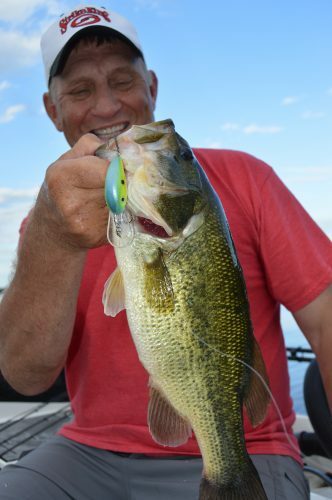 Clear Lake is a very versatile fishery. You can catch walleyes and yellows in the basin along with some crappies and perch. Try sixteenth and eighth ounce Buck-Shot Rattle spoons tipped with a minnow. But if you like to fish shallow, shallow being four feet or less, you can do that also. Bluegills along with more crappies are up there in the abundant vegetation. Tiny Mooska Tungsten jigs tipped with waxworms or spikes or the tiniest Impulse plastics will be productive. Wherever you live in the Midwest, there is a good ice-fishing opportunity within an easy drive. Clear Lake and Big Stone are two fantastic opportunities. In the next couple of months, do what you can to check them out.